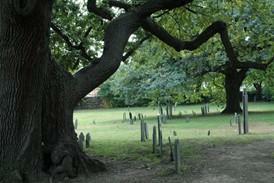 Salem MA is forever linked in the American imagination to the Witch Trials held there in 1692. The village, however, has a much more diverse history. Salem, founded in 1626 and was an important 17th and 18th century shipping center. After shipping's demise, the village became known for its excellent tanneries and show manufacturers. Today, Salem is a residential and tourist center with about 40,000 permanent residents. Salem was founded in 1629 as a small fishing port. It's name is an English derivation of the Hebrew shalom and the Arabic salam, meaning "peace." The port grew steadily and, by 1790, Salem MA was the sixth largest town in the United States. 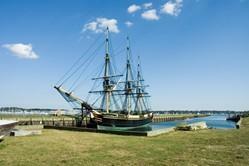 During the Revolutionary War and the War of 1812, Salem was a major center for privateering. Salem is also famous at the home of one of America's early authors, Nathaniel Hawthorne. His novels, which include The Scarlet Letter and The House of Seven Gables, were set in and around Salem. Most of the city's 17th century and 18th century architecture survives today, making it an ideal tourist destination. The infamous Salem Witch Trials began in 1692 and continued to the end of 1693. The town hysteria led to 20 people being executed as witches and dozens more being imprisioned, many of whom were young girls. Though it was a sad chapter in the town's history, Salem today capitalizes on the witch trials, with the Salem Witch Museum, numerous Halloween events, and a plethora of occult and wiccan shops. House of Seven Gables - The House of Seven Gables, also known as the "Turner House" or the "Turner-Ingesoll House" was built in 1668. The Ingesolls were cousins to the American author Nathaniel Hawthorne and his book of the same name was inspired by the multi-level frame house. Today, the house is a museum and gives visitors a glimpse of what life must have been like in the 17th and 18th centuries. Peabody Essex Museum - The Peabody Museum was founded in 1799 by the East India Marine Society as a repository for the interesting natural and manmade artifacts that the company's sailors collected on their journeys around the Cape of Good Hope. The Peabody merged with the Essex Museum in 1992 and today features a diverse collection of Asian art, American and Native American art, and maritime art. The museum also owns 24 historic houses and gardens, which create a living architectural exhibit. Salem Witch Museum - The most popular attraction in Salem, this museum explores the history of witchcraft throughout the ages and has a special section devoted to the Salem witch trials. Salem Maritime National Historic Site - America's first National Historic Site, Salem's includes nine acres of waterfront and 12 historic structures. The site tells the story of American shipping, from the late 17th century through the mid-19th century. Nathaniel Hawthorne's Birthplace - Located next to the House of Seven Gables, this wooden frame house was built in the late 18th century. Hawthorne was born there in 1804 and lived there until he was four years old. Salem is located just 16 miles north of Boston, along the Atlantic coast. The trip is about 30 minutes by car or commuter train and about one hour by bus. Salem abounds in [Massachusetts Bed and Breakfast|bed and breakfast inns] as well as offering the historic Hawthorn Hotel, located on Salem Common. The city of Salem comes alive in October with "Haunted Happenings," a citywide Halloween celebration. Activities begin early in October and continue through Halloween. Among the many offerings are theater productions, walking tours, a costume parade, and special events at the Salem Witch Museum.